The Philippine Archipelago is set like an emerald in the Western Pacific. The serenity of more than 7,107 islands and the richness of their soil have shaped the temper of its people. Today's Filipino descend from Malay seafarers who sailed from South China through Malaysia and Indonesia, in waves of migration. The Philippines was an early landfall of the western voyages in the sixteenth century. The Portuguese explorer, Ferdinand Magellan, claimed the islands in the name of King Phillip of Spain in 1521. But long before Magellan stepped on the central Philippine islands, an existing vigorous culture intermingled with Southeast Asia, Indian and Chinese influences, which continue to thrive in many parts of the country. 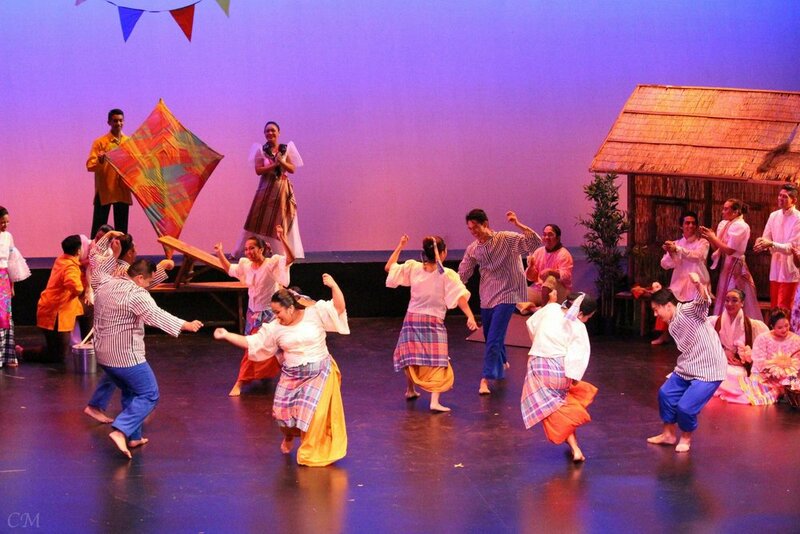 The unique blending of cultures brought from foreign lands, as well as those that existed with the early Filipinos, can be characterized through the dances, music and costuming of the early Filipinos. The repertory of the PASACAT Philippines Performing Arts Company brings to life the beauty and charm that is the Philippines! The throbbing sounds of the brass gangsas and native drums provide the exciting balance to the tribal rites from Northern Luzon whose people cherish the soil from which life comes. Dances depict mock battles, a pre-nuptial cleansing ritual with individual clay pots balanced and stacked by a bride and maidens and the mimicking of swooping birds in a thanksgiving celebration. The Spanish occupation opened the doors to many European influences in the Philippines, especially in Old Manila where the aristocracy was evident through regal gowns accentuated by the panuelo shawl draped over barren shoulders and the sheer barong tagalog shirts worn by gallant gentlemen. The dances show the playfulness of young ladies, a flirtatious escapade, elegant quadrille the pompous flipinized jota with the use of bamboo castanets. Asian influences are strongly evident in the southern largest island, Mindanao, where the Islamic faith is predominant. Knobbed gongs of various sizes produce sounds imaging the bottomless oceans. 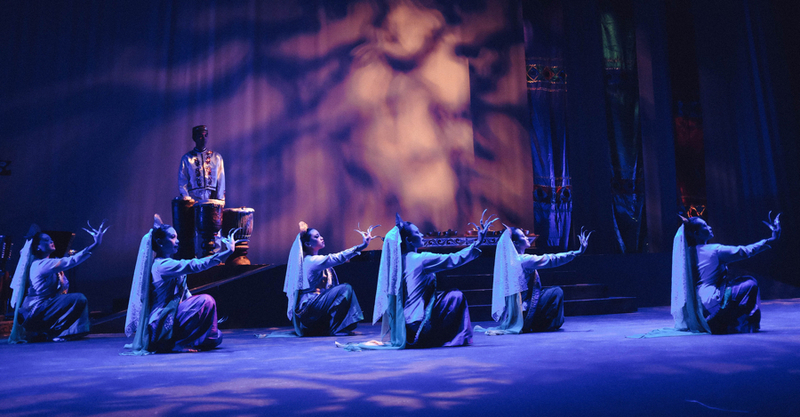 The exotic dances range in style with languid arm movements accentuated by brass fingernails, janggay, and imitating fishes to the dazzling Vinta display of colorful silk sails to the spectacular royal courtship in Singkil. Dancers in rich, jeweled tone colors provide a dazzling kaleidoscope with a prince, princess, fan dancers and soldiers as they perform through 8-12 crossed-bamboo poles representing the surging earth. From the Palawan province, the four-day harvest festival is depicted. Various rituals are performed to invoke and honor their ancestral sprits and the diwata – spirits of the skyworld and the underworld, of water and earth. During these occasions, shamans and priestesses called on the diwata to solemnize the union of warring factions at feasts, and especially heal individuals or the entire community. The babaylan or high priestess steps from her throne and whisks ceremonial straws to drive away evil spirits that prevent a good harvest. Male villagers then till the soil using bamboo, while young women plant seeds into the fertile earth. Maidens carrying bowls of fire join the priestess in this celebration which pays homage to the diwata, and consecrates both the village and the earth for a bountiful harvest. The blending of cultures brought to the Philippines is woven into the fiber of life reflecting the heart and soul of today’s Filipinos. The lowland farmers of Luzon and Visayas enjoy the celebration of life through music, song and dance. This repertoire of dances demonstrate the joy in all aspects of life utilizing everyday utensils, such as glasses, hats, bamboo, coconut, and benches. Dances include Pandanggo Sa Ilaw, which is the dance of lights simulating fireflies at dusk. The battle between Christians and non-Christians over the latik sweet residue of the coconut is re-enacted in Maglalatik. The international favorite, Tinikling, which is named after the long-legged tikling bird, mirrors the highspirited hearts of the Philippines as dancers perform between rapidly clapped bamboo poles.